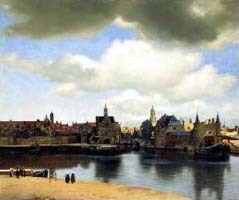 I have been looking at the paintings of Johannes Vermeer a lot lately. Especially the painting called “Gezicht op Delft” (View of Delft), painted around 1660, which presents the audience with a -seemingly- simple view of the city of Delft. But, as is often the case with the paintings of Vermeer, the painting draws the viewer in, guiding him/her into a more intense observation. For me, that’s the key word with all paintings by Vermeer: observation. The works invite you to observe, nothing more, nothing less. Go see this painting for real, by all means. You can find it in the Mauritshuis in Den Haag (The Hague). If you want to know more about the background of this one particular painting, here’s an interesting article by Kees Kaldenbach. For those bold enough to make their own attempt: here’s an article on “How to paint your own Vermeer”… Go figure. Next Next post: iPod killer: a bit of fun.